2009.01.20 Rei Gaiden Volume 4 Tankoban will be released on February 9th. 2008.12.31 HAPPY NEW YEAR TO ALL FIST OF THE NORTH STAR.IT FANS!! 2008.12.30 Raoh Gaiden Ten no Haou Anime Series ends after only 13 episodes. 2008.12.26 Jagi Gaiden starts serialization on Comic Bunch #4-5. 2008.12.05 ZERO Kenshiro Den will be released on DVD on February 27th. 2008.11.28 Toki Gaiden Volume 6 Tankoban will be released on January 9th. 2008.10.20 Ten no Haou TV Series DVD # 1 will be released on January 30th. 2008.10.11 Kenshiro Den at Japanese Cinemas from today !! 2008.09.13 HAPPY BIRTHDAY KEN !! TODAY YOU ARE 25 !! 2008.08.09 Movie of 1986 will be finally released on DVD on next November 21th! 2008.08.09 Souten no Ken Volume 19 Tankoban is scheduled for October 10th. 2008.08.09 Kenshiro & Yuria's wedding at Japanese Festival from September 13th. 2008.07.18 Please all visitors Sign My New Guestbook!! 2008.07.10 Ken il Guerriero Le Origini del Mito Volume 35. 2008.07.04 Rei Gaiden Vol.3 & Toki Gaiden Vol.4 for August 9th. 2008.05.24 Toki Gaiden Volume 3 Tankoban will be released on June 9th. 2008.05.15 Ken il Guerriero Le Origini del Mito Volume 34. 2008.03.14 Raoh Gaiden Ten no Haoh TV Series announced for Autumn 2008 !! 2008.02.25 Ken il Guerriero Le Origini del Mito Volume 33 from March 13th. 2008.02.09 Souten no Ken Volume 18 Tankoban is scheduled for March 8th. 2008.02.06 Toki Gaiden Volume 2 Tankoban will be released on March 8th. 2008.01.12 Rei Gaiden Volume 2 Tankoban will be released this February 9th. 2007.12.20 Toki Den OAV will be released on next March 26th in two versions! 2007.12.05 SILENT SURVIVOR (21st century ver.) new CD this December 26th. 2007.11.05 Toki Gaiden Volume 1 Tankoban will be released on December 8th. 2007.10.20 Ken il Guerriero Le Origini del Mito Volume 32 from November 15th. 2007.10.04 Special Interview to the authors of the Italian Original Song! 2007.09.06 Rei Gaiden 1 Tankobon will be released on October 9th. 2007.08.12 Ken il Guerriero Le Origini del Mito volume 31 from October 11th. 2007.08.09 Special Souten/Hokuto no Ken DVD on Comic Bunch 39! 2007.08.09 Toki Gaiden serialization starts in two weeks on Comic Bunch 39! 2007.08.02 Raoh Gaiden 5 Tankobon will be released on September 8th. 2007.08.02 Souten no Ken 17 Tankobon will be released on September 8th. 2007.07.29 Yuria Gaiden Tankobon will be released on August 30th. 2007.07.26 Raoh Gaiden serialization restarts next week on Comic Bunch 36! 2007.07.13 Ra Den Gekit no Sh DVD announced for September 28th!! 2007.07.10 Toki Den OAV Promotion starts on the Official Website. 2007.06.09 Yuria Gaiden manga ends this week on volume 13. 2007.05.19 Souten no Ken DVD #9 from August 9th (last volume)! 2007.04.22 Souten no Ken DVD #6 is postponed at May 24th. 2007.04.19 Rei Gaiden serialization starts next week on Comic Bunch 22-23! 2007.04.16 Hokuto no Ken VS Souten no Ken Official Guide April 13th!! 2007.04.15 Souten no Ken DVD #8 from July 13th! HnK 1986 Movie Original Script!! of Episodes !! NEW PURCHASE! Souten no Ken #19 Tankobon! GREAT PURCHASE! 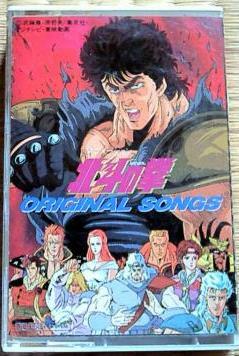 The 6 rarest books Hokuto ou Ken of HK. Tough Boy/Love Song Audio Tape! The last! NEW PURCHASE! Synthesizer Fantasy Audio Tape! Great! NEW PURCHASE! Souten no Ken Audio Drama CD! Souten no Ken DVD last Volume 9! FANTASTIC! Korean Movie on ORIGINAL VHS! NEW PURCHASE! Live Action Movie Japanese DVD! NEW PURCHASE! 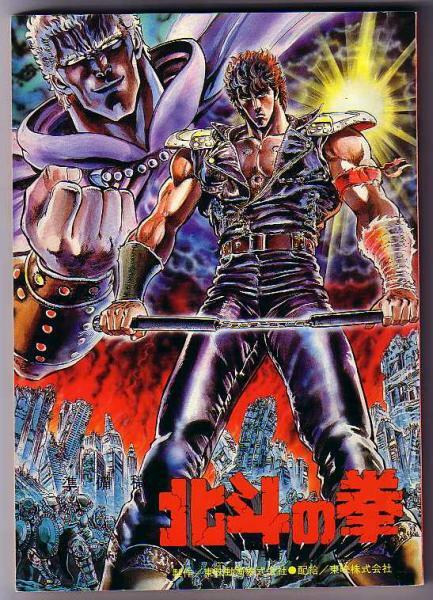 Shin Hokuto no Ken Italian DVD #3.
the 13th volume! NEW PURCHASE! Original rare Trading Cards Series 1&2! NEW PURCHASE! Il Re del Mondo! NEW PURCHASE! Cinema Ticket from 2008, very rare! The reproduction of these pages is prohibited. All the stuff that belongs to the series of Hokuto no Ken is copyright© of the legitimate owners. The website is born for fun scope and no infraction of these copyrights is therefore understanding.